Though the parallel of the internet with the Renaissance triggered by Gutenberg's movable type and the emergence of other new media was already apparent to me, it was a bit of a shock to see how other media have always initially be used to empower people but later become monopolised. This video rings true to me. Thanks to Jeles for alerting us to THE ECONOMICS AND POLITICS OF CLIMATE CHANGE AN APPEAL TO REASON by Nigel Lawson, a critique of the "scaremongering Stern Report"
Nigel seeks the answers to three questions, of increasing complexity. First, is global warming occurring? Second, if so, why? And third, what should be done about it? This will be a brief reply as I am bogged down with work at the moment...but I have to say, from a scientific point of view I find Nigel Lawson's arguments to be VERY flawed. From an economic view point, well I am not an economist so I don't claim to know everything he's talking about, however, I do know a little about the IPCC scenarios and from what I can see his arguments just do not stand up - also after doing some research on him, he appears to be a very hardline conservative economist around from the Thatcher era. There are a few articles about him that I've found which I won't go into, but from what I read, he seemed to take very extreme views on economic policy. further global warming since 1998." I am not sure where he got this information from but it is blatently incorrect. The above link is from the observational record from the UK met office (who run the Hadley Centre in Exeter). Now if you have a look, yes 1998 was indeed the hottest year on record, but it is a blip in a time of cooler temperatures than present. 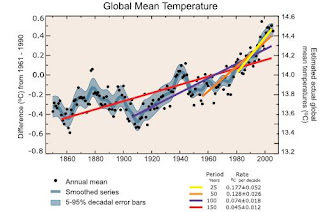 As Mr. Lawson rightly points out, natural variability accounts for such things, with temperatures varying quite a bit from year to year - even decade to decade and century to century. However, if you look at the last 5 years of the graph, I think it is utter nonsense to say there has been global cooling or even stabilisation, in fact, since 1998, though subsequent years have been slightly cooler, they have been consistently warmer than every other year (bar 1998) in the observational record. Even if you were to consider 1998 to be an anomaly...an abnormally hot year, so we ignore it... you cannot ignore the fact that from 2001 onwards...the last 5 years...have consistently been the hottest on record since 1850. Now, one of the first things we learn in climatology is that it is the study of weather averages and we should not take year-to-year values as fact due to internal variability. So, we like to filter these values by taking longer running averages such as 10 years. After taking these, and also looking at the raw data, I find it very difficult to ignore that temperatures have been consistently increasing since the 1900's and that these VERY closely relate to CO2. However, I'll get onto that in a second. For a longer version of the observational data go to http://www.ipcc.ch/present/graphics/2001syr/large/05.24.jpg This is the version from the IPCC TAR that came out in 2001...so these are a little behind the times. Ignore the projections but now take the line out to +0.4 celcius in 2005...you can quite clearly see that this is the hottest period, even taking into account uncertainties, the medieval warm period (which Lawson also speaks about) etc. etc. it is now hotter than any of those times in the last 1000 years. I can show everyone more graphs extending further and further back if you wish to see this for the past few thousand years. He is actually correct with this statement. Water vapour is the most important greenhouse gas (GHG). However, he has failed to make a crucial link here and that is the following. Both water vapour and carbon dioxide make up very little of our earth's atmosphere, most of it is Nitrogen and Oxygen. Now, firstly, CO2, while it may not be the most "important" GHG, you can very, very clearly see a link between it and global temperature...and you can see this on a timescale of millions of years. There is only a finite amount of water vapour that the air can hold at a given temperature. But this is the point...as the temperature increases due to increases in CO2, the amount of water vapour the atmosphere can hold also increases...warmer air can hold more water vapour. So, with temperatures somewhat increasing from more CO2, the amount of water vapour that can be held in the atmosphere also increases...leading to warmer temperatures, more potential evaporation of water vapour and the air able to hold more of it and so that increases the temperature yet again etc. A great example of this with CO2 feedbacks can be seen on Venus. Even though this is not Lawson's conclusion, he's dead right. This was the one thing I had to critise about Mr. Gore's film. The point with any form of climatology is that you can NEVER attribute a single event to climate change because by the definition of climatology, it is a change in the average of events. However, in saying this, I went to a talk on extreme weather the other day where this issue was discussed by a few of Australia's top tropical cyclone meteorologists. The consensus at present is that it is not shown how global warming will change tropical cyclones. However, with the recent American season (2005) being somewhat fuelled by anomalously warm temperatures in the Gulf of Mexico, there is reason to question whether tropical cyclone intensity may increase in the future. Knowing what we do know about tropical cyclone dynamics, studies have been done using computer models to simulate changes. The general consensus of these studies so far is there will be an increase in the intensity, but an undetermined change to the frequency of tropical cyclones. This is something that is being studied as we speak. I was going through the very first IPCC report from the early 1990's and I was looking at the projections. I was interested to know if the projections from back then were fitting with what was happening now. I mean 15 years is not a long time BUT we are starting to get into the period or projections that are centered around 2020. The projections are bang on. In fact, using a middle of the road scenario as a guideline...we are actually above that line more toward the upper end of the projections. Take what you will from that, I just thought it was interesting to have projections verefied like that. Anyway, I have much work to do and don't have time to write more. I hope this made sense to everyone as it's been written quickly and somewhat haphazardly...any questions, let me know. A comment by anonymous on March 18, 2012 says: "The statement by Lawson that, there has so far been no further global warming since 1998. is true"
A picture is worth 1000 words, this one from the IPCC Fourth Assessment Report: Climate Change 2007. Readers can make their own assessment as to whether 1998 was an unusually warm year and whether the underlying trend still continues after 1998. As to whether "CO2 follows warming, not the other way around" , this may be a reference to the views of Bob Carter who believes that CO2 has always followed climate in the geological record. I invite readers to read up on Bob Carter and make up their own minds on this. Game Programming teacher receives top award. Award-winning Tasmanian Government school teacher Margaret Meijers is now officially one of the most outstanding teachers in the world. Margaret, a teacher at New Town High School, won the Content category for her Games in Learning programs at the Microsoft Worldwide Innovative Teacher Awards announced in Philadelphia in the United States this week. It was a pleasure to contribute to the eTrain conference. The eTrain conference was a Melbourne Grammar School initiative in conjunction with the AISV (Association of Independent Schools Victoria) and the Australian Government Quality Teacher Program. The Collingwood Children’s Farm and Abbotsford Convent was the site of this inaugural event. The event was both an innovative learning experience the 100 or so year 5 and 6's and a showcase of ICT based learning for the many visiting teachers. There were 14 programs that kids could chose from, including video making, podcasting, claymation, Kahootz, music and art. I ran a program on game making for 6 students but with the frequent visitors it was often 18. You can upload their creations. Congratulations to the organisers, this is what school could and should be like.